The first team travelled to Bristol to play Roman Glass St George and their hard-fought win secured their first double of the season, having beaten their opponents 2-1 at the Playing Field only three weeks earlier. A family bereavement saw the withdrawal from the squad of George Rogers while recent signing Lewis Tasker and Sam Jones were also unavailable. Manager Clive Jones did however have brothers Sam and Conor Bryant and Joe Chamberlain back in a strong line-up which saw Tom Hawkings return to a central defensive role and Scott Drayton move up into midfield. The 3G surface at the home of the Gloucester FA adjacent to the motorway has never been a surface that has suited Wellington and this as no exception as they struggled to cope with the bounce and much quicker surface. In the first period most of the home side’s moves emanated from Ibrahim Sarr who seemed to be everywhere and Matthew Guy should have done better with an early header from a Sarr free kick. Minutes later, the lively Ryan Radford just failed to connect with a Sarr cross in front of goal and Ken Odi, following up, had his shot blocked by keeper Josh Mclean. Defender Sam Wentland had a heading opportunity and Radford slipped past the defence with a deft touch but Sam Bryant was on hand to clear. Somehow Wellington survived the storm and were able to mount a couple of attacks down the flanks before Mclean was called into action to clear a back-pass but Rhys Hodgson charged down his clearance with the rebound narrowly missing the target. The visitors then took a surprise lead when a good build-up between Chamberlain and Josh Wadham resulted in Chamberlain seeing his effort blocked at the near post but Glen Wright was on hand to score from close in, his shot being deflected into the net. After 30 minutes Sam Bryant sustained a facial injury which saw him replaced by Lewis Pocock and, shortly after, a collision saw the home team’s Hodgson stretchered off with a recurring hip problem. A poor clearance was picked up by Sarr and, with Mclean off his line, his attempted lob went just over before Wellington went 2-0 up. A break involving Conor Bryant and Chamberlain saw the ball played out to Wadham on the left who cut inside and unleashed an unstoppable shot from outside the corner of the box which gave goalie Josh Dempsey no chance. Shortly before the break a long ball from Mclean found Wadham who fed Jack Bryant but his drive went just over. The second period was a very scrappy affair with Roman Glass dominating possession. 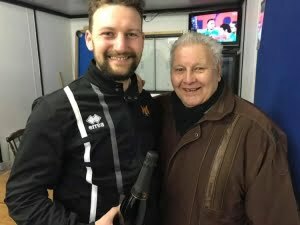 They came close to reducing the arrears after just three minutes from the restart when Radford crashed a shot which beat Mclean but smacked against the crossbar while a shot from Matthew Guy almost squeezed between the legs of the Welly keeper. Odi then squandered two chances with poor finishing as Wellington battled to defend their advantage. Jack Bryant was replaced by Aaron Hawkings and he settled well into a midfield role and later Paulo Borges replaced Joe Chamberlain. With nine minutes remaining, the referee awarded what looked to be a soft penalty and Radford made no mistake from the spot. The home teams hopes were however dashed when a ball from Jack Bown-Porter down the line was chased by Conor Bryant who dispossessed the hesitant Jordan Greenwood and, spotting Dempsey off his line, clipped the ball over him just inside the upright to restore the two=goal cushion. They could have added a fourth before the end when a quick break saw Borges clear and he fed Wright whose effort was partially blocked and went just wide. It was hardly a classic but Wellington’s defence had stood firm and the team had fought hard for their victory which saw them move up to 11th in the table. PHOTO: Central defender Tim Legg was named man-of-the-match and the award was presented by Brian Jones.